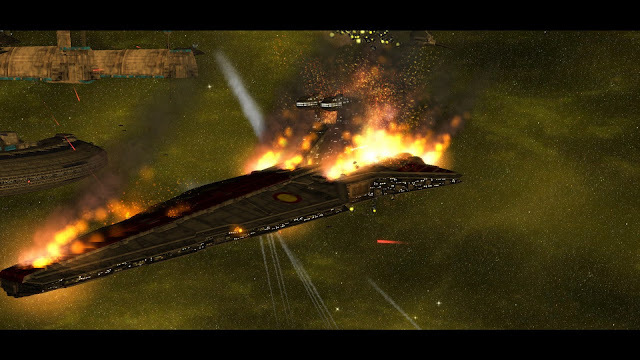 Republic at War is my mod of choice when it comes to scrapping clankers. Version 1.15 is the latest release, though it launched approximately two years ago, development has slowed but not yet died. Regardless Republic At War V1.15 is a complete experience and a refined one at that, featuring two factions; the Grand Army of the Republic and the Confederacy of Independent Systems – the clones and the droids in other words! What truly sets Republic at War apart from any other Empire at War mod I’ve spent time with, is the speed and flow of the combat; it’s ferocious. Like the current of a descending rapid, when compared with the more typical trickling stream of other mods. Stepping into a campaign for the first time in this mod is the most wonderfully sobering experience. Let’s spin a short yarn; as with every campaign, I spend my opening minutes establishing an economy, redistributing my starting forces, and building Star Destroyers (or the closest thing to them). But I don’t just build them, I start creating characters, simple backstories, and filling the fleets full of ships that serve the narrative as much as quality tactics. When, unprovoked a CIS armada drops out of hyperspace over Kuat, the Republic’s primary shipyards, and Captain *insert generic space name* and their task force are reduced to a smouldering collection of husks, before I even have the time to devise opening speeches. Sometimes engagements really do feel that fast; a trio of Munificent frigates will tear down an Acclamator’s shields and perforate its hull, before you can so much as consider ordering any kind of retreat. It’s brutal, just like the Clone Wars. Unlike the Old Republic era mods we last discussed, Republic at War places far more emphasis on the ground units, with a respectable but not burgeoning roster of space units. The necessary inclusion of the Republic’s LAAT/i ensures that ninety per cent of invasions kick off with gunships full of (my) clone troopers being blasted from the sky. As you can tell by the garish ARC gunship below, Republic at War embraces parts of the extended fiction – for lack of a better term – specifically the Clone Wars cartoon series, rather than the later animated series of a similar name. The cartoon is also the source I suspect, of much of the unit dialog. In essence, Republic at War represents a time when there were plenty of Republic Commandos, but no Snips. Republic at War’s use of the technology mechanic is one of the most impressive I’ve seen and a compelling factor in its own right. Whereas in the base Empire at War and Forces of Corruption games, the technology system is simply used to gate your access to more powerful units, Republic at War offers more. Progressing through the technology tiers will net you new units, but rather than simply expanding you roster, it reflects your place in the Clone Wars timeline. 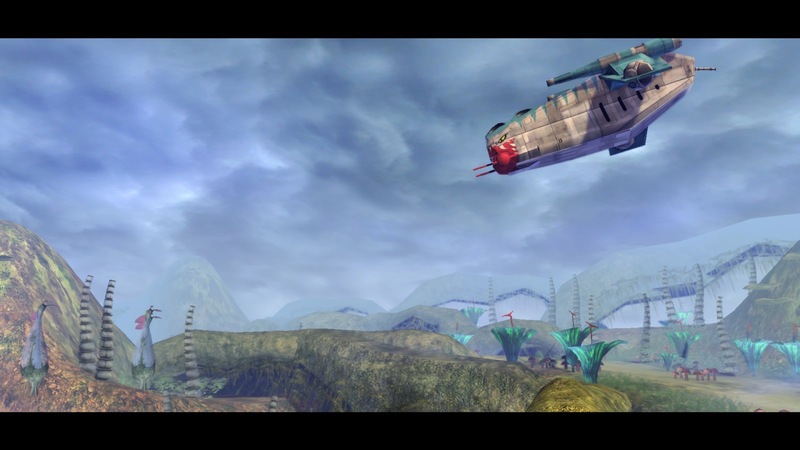 Clone troopers advance from phase I to phase II armour, capital ships replace their complements of V-19 Torrent’s with the later ARC-170s, the Victory I-Class Star Destroyers are introduced, and so on. 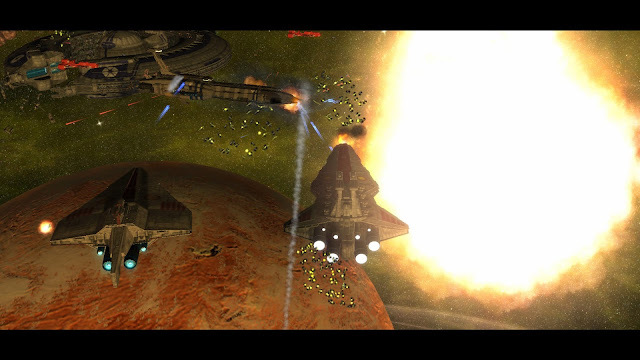 Republic at War’s technology system feels so much substantial because of the clear visual reflection of your progression, made possible by the wide source material of the era. Most exciting of all is the inclusion and ramifications of Order 66, which rears its Jedi-purging head sometime after advancing to the fifth and final technology tier.